I’ve been on a manga-kick for the past couple of months. It started with my love for One-Piece and Inuyasha animes. I bought a couple of volumes from each manga. Then I started to pick up to occasional copy of Shonen Jump (when it was still in print here in the United States). Before you know it I’m learning about manga techniques from Imagine FX and Comikers. I’m a little late to the game, but I also bought a copy of How to Pen and Ink from Amazon.com last year. When I bought How to Pen and Ink, Amazon claims that it’s a Comickers book, when in actuality it’s published by Digital Manga Publishing. (DMP owns the license to publish How to Pen and Ink in the U.S.) How to Pen and Ink was originally published in Japan by Bijutsu Shuppan-sha, LTD, they publish Comickers Art Style (Which is current defunct). So it’s sort of a Comickers book. The book itself is divided into three parts: Special Technique, the Boot-camp, and the Appendix. I’ll go through each section in a little bit. How to Pen and Ink is well designed, and reminiscent to the look of the original Japanese version. Within the first couple of pages, there’s a beautiful overlay of the pencils for a piece that Oh!great created just for the book. The first third, Special Technique, is in full color, containing a combination of photos and beautiful illustrations produced by Oh!great, Nightow, and Shiki. The rest of How to Pen and Ink is in black and white, which is understandable, since the focus is on manga. How to Pen and Ink, starts out by placing us behind the shoulder of mangakas Yashiro Nightow, Oh!Great, and Satoshi Shiki. 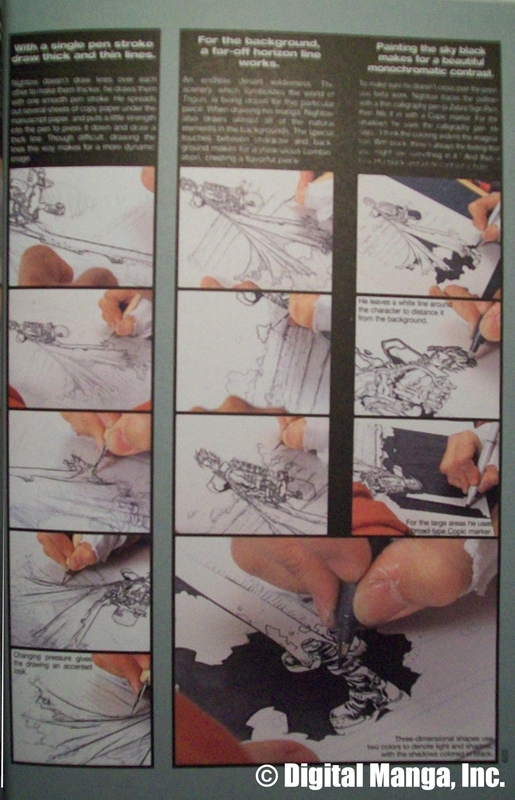 Readers get to see step-by-step demonstrations of the techniques and works from start to finish by each of the mangaka. I was real ecstatic by that. It’s always good to see how the professionals work. We also get to see some of the tools they use and how the mangaka use them. Comickers also interviews each of the artists, where we learn a little about them personally, read about the manga techniques they use, and their experiences in the manga business. This section could had been a book of its own with another two mangakas. The next third is an extensive, ground-up manga boot-camp, loaded with tips and techniques. The boot-camp is broken down into sections. The first step of the Manga Boot-Camp has a sharp focus on beginners. The content is basically in the form of a manga about a frustrated little guy who desperately wants to break into the business. The reader follows our little-guy as he learns to create a name (a mange page) from conception, all the way to applying screen tones. The next section picks up where the manga left off. Step two of the Boot-Camp has a focus on intermediary manga students/artists. It goes over practically every single little issue, problem and technique that a budding mangaka needs to learn about and/or constantly runs into. Step three is a beneficial four-week training program to get students up to snuff with pen and ink. I say the training program is beneficial because it starts readers off with very basic pen exercises using a G-pen (crow quill dip pen). Then the book works you into more advance techniques such as speed lines, line variations, and cross-hatching. This isn’t literally an Appendix. 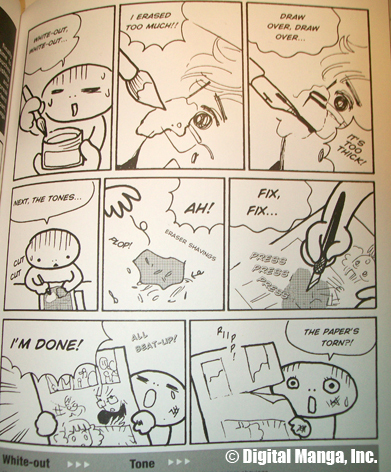 The Appendix actually contains a huge survey of manga artists and what tools they use. That means lots of fine print. We even get a ranking as to the most popular art supplies among manga artists. Towards the end is an Emergency Index to quickly look up topics. Overall, I think How to Pen and Ink is a great book, especially if you’re learning to ink. Even if you plan to ink digitally, the techniques you learn from this book can also be applied to the digital world. (Read How to Make Screen Tones! – Part 1) For beginners, How to Pen and Ink will usher you from the basics to more advanced manga techniques. You can buy your copy of How to Pen and Ink from Amazon now.